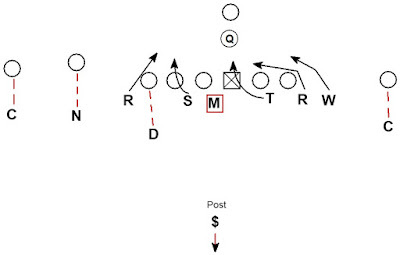 When a TE is in the game, one tried and true pressure strategy is to slant the defensive line to the TE and send extra rushers to the open side (opposite the TE). The philosophy is simple, the moving DL make the TE side runs more difficult and help build a wall. The defense is looking to force the RB to hit the wall or cut back way from the moving DL into the extra rushers. 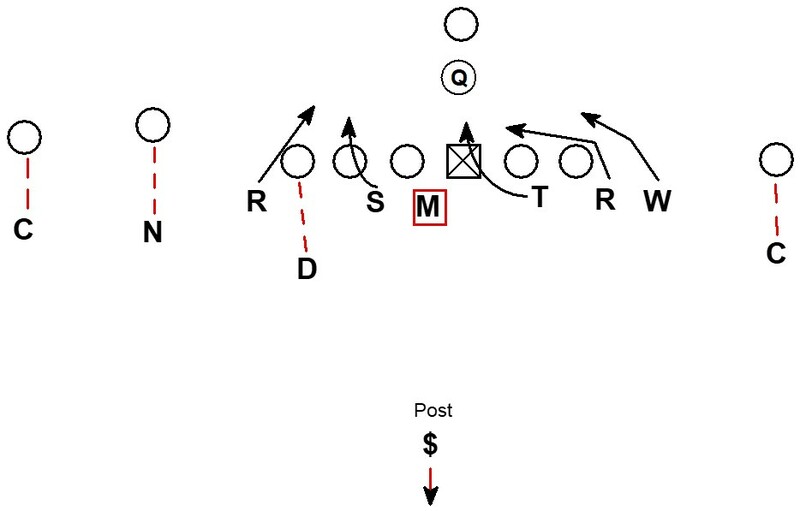 Michigan is in a sub personnel with 3 LB's 2 Rush Backer (OLB/DE types in 2 pt stances) and 1 down lineman. The secondary is a 6 DB dime personnel. The front is slanting to the DE with 2 edge rushers. The inside edge rusher is able to bend flat and chase down the RB on run away while the outside edge rusher is able to play for boot/naked from the QB. Cover 1 with the mugged up LB manned on the RB. Good job by the TE side edge rush building the wall and the bending open side rusher chasing the RB down. Good stuff from Coach Brown and the Wolverines.